Can never wait to wear this little Esprit jersey dress – cool, comfy and perfect with apron and protective footwear for a day in the kitchen. By the end of today there should be a collection of delicacies as cute as my apron and visitors’ beds made across Brisbane ready for Christmas! 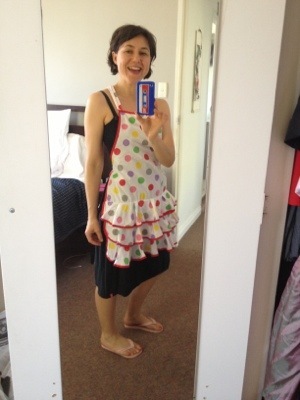 OK half way through, so time for costume, I mean apron, change for good luck. 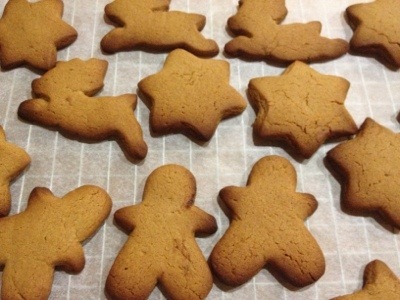 I am about to try and bake my first ever gingerbread men, stars and reindeers … Wish me luck! After the massive fail with my chocolate shortbread in September, I’m going to need it! 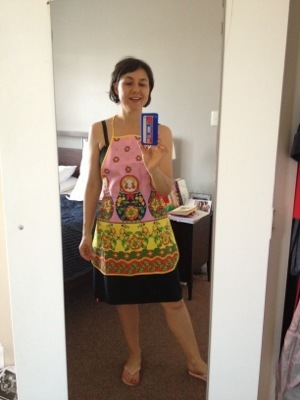 Posted in Brisbane Fun, casual, Esprit, fashion and tagged apron, Baking, Christmas, Christmas Cookies, Gingerbread Men, Havianas, Ninja Bread Men, summer. Bookmark the permalink.